Finally I gave myself the chance to hear the man but only for the first 10 mins of this session with the well respected 60 minutes program. The man doesn't talk any sense at all but I think he will succeed with quite a few, exactly how many I don't know because I don't feel the pulse of American society. Just as people can be persuaded to buy useless doodads on TV they would buy his nonsensical shallow messages. I wonder how many voters are emotionally vulnerable to him. These are the ones who felt left behind and the present system work against them, however they try they will not do well. These people want to the change the entire system and that is what Trump is selling them. But like Brexit, Trump promises are just promises. He can't deliver but nevertheless can cause a lot of trouble especially outside America where there is no check and balance to stop him. Accusations of plagiarism against Melania Trump flew quick and fast. The Economist has even gotten creative with Ctrl-C and Ctrl-V as the typical Trump supporter probably doesn't know what that means i.e., copy and paste. 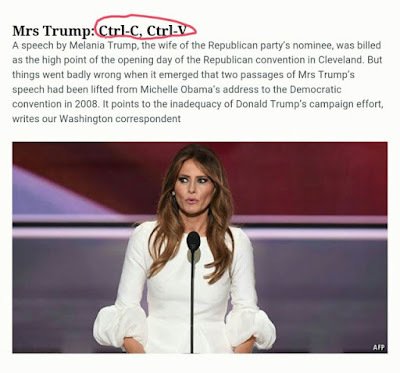 Melania Trump was of all things speaking about integrity whilst stealing parts of her speech from Michelle Obama. Not some obscure personality who spoke in a totally different context but during the 2008 DNC. What an epic embarrassment for the Trumps. All these is reminding me of Sarah Palin. It didn't stop with her. The juggernaut of idiocy and stretchable morals rolls on. Donald Trump, I am sure won't be apologizing if he can help it. 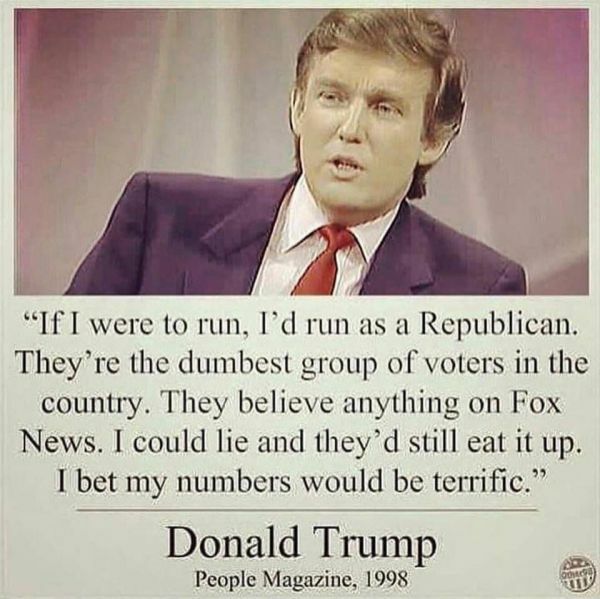 This is not available to the Dems to use against Trump, but what if as blunders and contradictions accumulate along the way, Trump supporters began to be self conscious that they might actually have little brains. I won't go as far as him but in a relative sense I would agree. You can tell the USA is a great country when they can survive such stupidity. We would not have a chance.